I got a job. This is thought provoking for me on many levels. I am excited to revisit my career, and I am hesitant to do that at the cost of leaving my young children. However, I am picking up something more valuable than money by taking this job and that is health insurance. My husband is not able to have the transplant at the hospital, and with the oncologist he has known for years and by getting new health insurance, I will enable him to do this and have that important comfort level during his procedure. I am doing this for a purpose, and more important than my presence everyday for my kids is the presence of my husband for many days going forward. This job seems to be meant to be, every aspect of taking this job has flown seamlessly. I already know my boss and I've worked with her before, I don't have to work any weekends at all, which is very unusual in my field, and the salary and benefits are great! 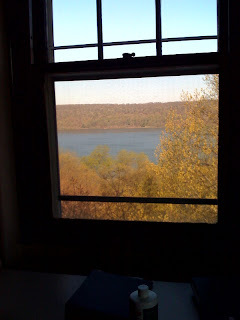 Best of all is the beautiful view of the Hudson River from my window... I will place the photos of my husband, my hansom boy and my beautiful girl in front of me, and as my eyes scan my three beauties, from one frame to the next, in between them will be an eyeful of the natural beauty of the river.